Walking through the lavishly paved road, I came to a halt where a tiny street intersected. I stood there, watching people hurry to work; the cars on the road honked none too gently, and the impatient bikes made their way through the gaps in between. The sun shone brightly upon the land beneath, and I raised my face, as though I could feel the vitamin D seep through my skin. It was a busy day. Little girls with tiny gowns stood waiting for their school bus to pick them up. I stood there still, waiting. In fact, I did not know anything. I had been coming to this place everyday since I woke up all alone in that dirty place, knowing I’d get some clue about something I might need from my old life. I didn’t even remember who I was. I had found my phone, and in that, there was a reminder.. reminding me to visit that place everyday. Why would I have visited that place everyday? It was just an ordinary road anyway. But something inside me told me it wasn’t. When I woke up from oblivion a few days ago, I had found myself in a dirty place, fully beaten up; beside me were someone’s divorce papers – perhaps they were mine; I had also found a bag full of money, enough to last a lifetime. If I really wanted, I could’ve started a new life; gotten all that I needed. But some part of my brain disagreed. It told me there was something that I needed much more than money. Just then, a little girl came down the cramped lane and walked towards her friend. Her skin was pale, yet healthy. Her eyes, innocent. When those tiny eyes met mine, she froze. So did I. And with that one look at her, I knew. She was everything I needed. I even realized why I would want to come here everyday. Though I didn’t remember her, didn’t recognise who she was, I knew she was the one for whom I had been living. She was certainly worth waiting for every morning. He never held me tight enough. There is no ‘he’ really. This is just another Haiku I wanted to write, and I created a scenario for it myself. This one is better than my other Haikus, don’t you think? The Daily Post had been asking the bloggers: Open your nearest book to page 82. Take the third full sentence on the page, and work it into a post somehow. The last time the Daily Post had asked me to look at a random sentence in a book, I had been lazy and took out an ebook, and wrote from that. I didn’t even have a book nearby. But today, however, I had a book at arm’s length. 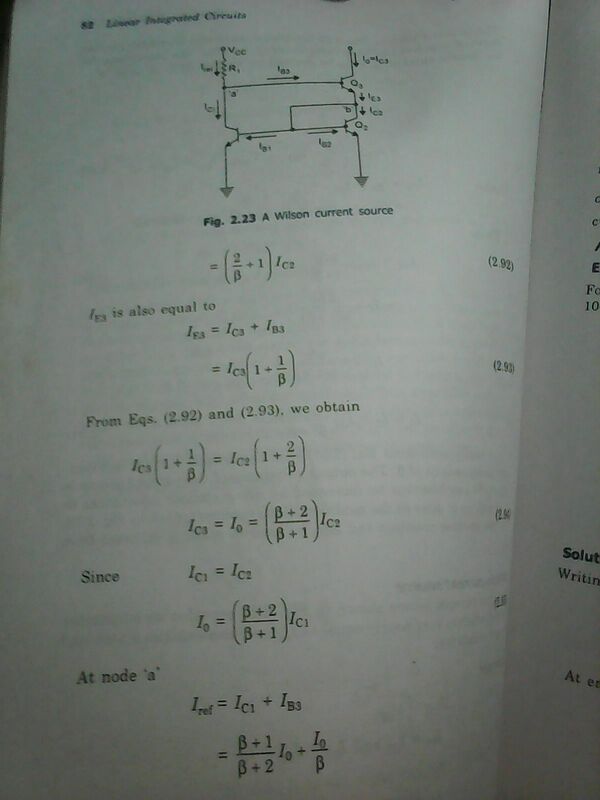 A very dangerous book, though — Linear Integrated Circuits, because I don’t even know what to write about it. Anyway, I hoped that I’d get some text about a transistor or something, and I’d write a little bit about it and somehow escape. But do you know what I found on page number 82? That’s right, I found this. I never expected something of this sort to pop up, given that I haven’t touched this book in years (then you must be asking why exactly this book was on my table? I really don’t know why I took it out… I kind of missed it a teeny weeny bit, maybe… but I never once opened it… and it lay there for weeks like that). The circuit we’re going to talk about. 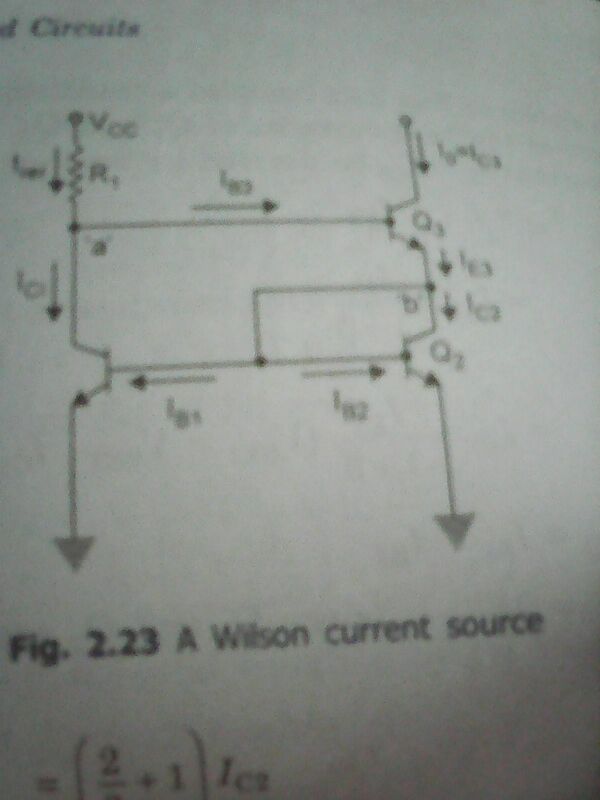 So, here… I see three transistors in the circuit. Do you see them? They’re the little things that look like vessels that can hold water temporarily, to be simply put. You do see one transistor at the left, and the zig-zag line beside it, don’t you? Meet Res, the sweet li’l resistor and his step-mum. Two others are on the right side, and labelled Q2 (the lower one) and Q3 (the upper one). You might have a bit of difficulty spotting the letters in this photograph, because Nokia’s excellent in its own way, providing me security and privacy from the cyber-strangers that are my blog readers. After all, you cannot let strangers look at your photos… It’s smart, in its own way, but no one ever acknowledges it as a ‘smartphone’, my mother’s yellowy Nokia, while the other phones that disclose their master’s/mistress’ top secret photos clearly, giving no room for imagination, the poor unimaginative, traitors of the cellphone owners are often celebrated as the smart ones. People keep on misunderstanding the non-touchscreen, less-than-2-mega-pixel-camera phones. After all, as they say, it’s not where’re you’re born. It’s about where you die, about how much you’ve accomplished on earth. And my phone is not dead yet, (third hand and working better than it’s touch-screen counterpart) and has lived on this earth for many years without diagnosis or treatment, unlike one of its young, touch-screen counterparts, which is right now in its coffin. Anyway, I think I have lost my cute little transistor triplets while trying to defend my mother’s camera, because dear Q2 here is running towards Q1 (the one clever transistor in the left that did not disclose its name to you earlier). “Mama!” cried the silent Resistor from beside. Watching a couple’s relationship spiral down to dust, I wrote this poem. They weren’t made-for-each-other, but they still manage to live together and smile, just because they love their daughter quite a lot. They’d rather torment themselves than see her frown. What a wonderful pair indeed! Love, sometimes, comes from somewhere you don’t expect. Not from each other, but from the happiness of someone else they didn’t think of while they got married… Anyway, they never quite spoke much to each other. Though the couple were adjusting, living in the same house, their relationship could not be repaired is what I came to find out. I often drop by for a chat with Mrs. K, but Mr. K doesn’t talk much to me. Like the glass of my window pane. Like a boulder on the mind of the sane. Like the nothingness amidst sheer pain. Like the dirty waters of the polluted oceans lain. Like a coin running down the drain. Like a villain on a fine day slain.